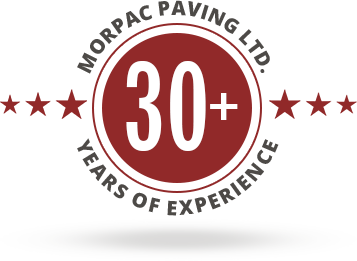 Residential Driveway Paving – Morpac Paving Ltd.
Asphalt paving represents an excellent value to Toronto homeowners for being relatively easy to install and resistant to the extremes of our climate. Asphalt residential driveways are also easy to maintain and last longer than concrete driveways since they are engineered to resist freezing and thawing. Drainage. Water is the single biggest destroyer of asphalt paving around the world. We will make a drainage plan for your driveway such that standing water stays away at all times. Gravel Base. Think of the gravel base as the foundation of a building. The asphalt driveway is only as strong as the gravel base beneath it. Trust us to deliver a long-lasting residential driveway with a foundation of resilient gravel base. We are equipped with plenty of latest and relevant equipment as well as skilled workmen to construct an average sized asphalt residential driveway within 1-2 days.